Originally intended as a project for Blake Edwards, the film version of Pierre Boule's semisatiric sci-fi novel came to the screen in 1968 under the directorial guidance of Franklin J. Schaffner. Charlton Heston is George Taylor, one of several astronauts on a long, long space mission whose spaceship crash-lands on a remote planet, seemingly devoid of intelligent life. Soon the astronaut learns that this planet is ruled by a race of talking, thinking, reasoning apes who hold court over a complex, multilayered civilization. In this topsy-turvy society, the human beings are grunting, inarticulate primates, penned-up like animals. 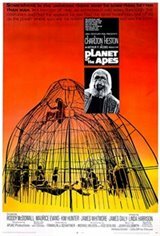 When ape leader Dr. Zaius (Maurice Evans) discovers that the captive Taylor has the power of speech, he reacts in horror and insists that the astronaut be killed. But sympathetic ape scientists Cornelius (Roddy McDowell) and Dr. Zira (Kim Hunter) risk their lives to protect Taylor -- and to discover the secret of their planet's history that Dr. Zaius and his minions guard so jealously. In the end, it is Taylor who stumbles on the truth about the Planet of the Apes: Damn you! Damn you! Goddamn you all to hell! Scripted by Rod Serling and Michael Wilson (a former blacklistee who previously adapted another Pierre Boule novel, Bridge on the River Kwai), Planet of the Apes has gone on to be an all-time sci-fi (and/or camp) classic. It won a special Academy Award for John Chambers's convincing (and, from all accounts, excruciatingly uncomfortable) simian makeup. It spawned four successful sequels, as well as two TV series, one live-action and one animated.